Culinary Physics: How to Use Herbs in Cooking Delicious Food? The technique in which fresh herbs are handled directly correlates to the intensity and rate of the flavor release. Herbs’ flavor molecules are located in oil glands in or on the surface of the leaf. When damaged or crushed, the oil glands blow up, releasing the aromatic essential oils, which hold the herb’s flavor or aroma. 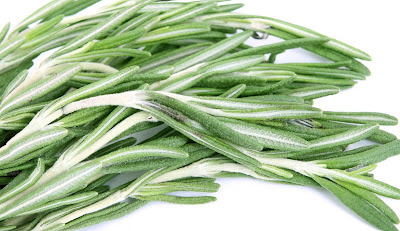 Hardy Herbs, such as bay and rosemary, usually come from dry climate. Their tough leaves are excellent at retaining onto moisture and oils, and therefore flavor. Delicate Herbs, such as cilantro and basil, have fragile leaves and a milder, more floral scent, and their flavor evaporates quickly. Many delicate herbs, in particular mint and basil are susceptible to browning because they have high levels of a browning enzyme, polyphenol oxidase (PPO), which is activated when cells are damaged or crushed. The list below looks at different ways to prepare hardy herbs and delicate herbs to help best preserve their flavors during cooking. How to Prepare Hardy Herbs? Acclimatized to deal with dry environments, these more robust herbs release their flavor slowly, which gives them greater versatility in cooking. 1) For a more intense, quick release of flavor, finely chop the leaves to break more of the oil glands. 2) For a mild flavor, hardy herbs such as thyme or rosemary can be added whole to a stew or slow-cooking dish, and then removed before serving. How to Prepare Delicate Herbs? These herbs release their flavor quickly, so avoid crushing or damaging them excessively before adding to food, because they will lose their full flavor before the rest of your food is cooked. 1) Chopped leaves can be soaked in oil (e.g. virgin olive oil) to prevent air reaching the damaged cells, which helps stop the browning reaction. Plunging chopped leaves into lemon juice also reduces the efficiency of the browning enzyme. Some varieties of herbs are less prone to browning such as napoletano basil. 2) To stop browning, before cutting you can first quickly steam or blanch herbs for 5–15 seconds at 194ºF (90ºC), which destroys the browning enzyme. If left on the heat for too long, however, the leaves will shrink or shrivel. 3) Dry leaves before chopping, and slice cleanly with a very sharp knife to burst the glands with the least collateral damage. How to Use Fresh Herbs in Cooking? 1) You don’t need pricey or extraordinary tools in order to cook with fresh herbs. The only tools you’ll need are a pair of sharp kitchen scissors, a sharp knife, a chopping board and a fine sieve. Add to that a mortar and pestle or food processor, and you’re well supplied to get good cooking. 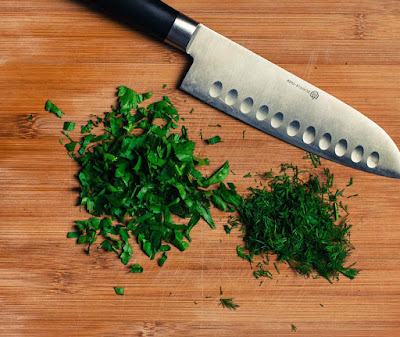 2) Chopping fresh herbs very fine such as in a julienne or chiffonade exposes as much surface area as possible, which in turn allows the most flavors to be released. 3) When you are using fresh herbs, set aside the leaves, flowers or seeds, and either discard the tougher stems or set them aside to add flavor to soup stocks. Shear the leaves right over the pot or dish. For larger amounts, mince a pile of leaves with a sharp knife. For recipes like pesto, when you need a hefty quantity of fresh herbs, a high quality food processor is an essential tool. 4) When garnishing with sprigs of herbs, bear in mind that they contain a lot of water and will wilt or shrink if they get hot and dry. And like any green vegetable, herbs discolor if overcooked. 5) Fresh Herb Conversion. 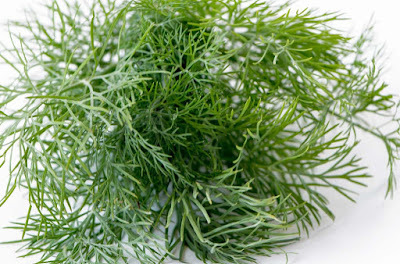 When adding fresh herbs into recipes, remember that you need more fresh herbs than dried herbs. A general conversion rule is 3 parts fresh herb to 1 part dry. 7) Leftover herbs are easily stored for later use. Freezes chopped herbs in plastic bags, or mix them with water and freeze them in an ice cube tray. 8) You can easily dry fresh herbs yourself in the microwave between paper towels, or preserve their flavor in oils, vinegars, and compound butters. When to Add Herbs During Cooking? How to cook with fresh herbs? Adding herbs at the right moment during cooking helps to bring out the most flavors in cooking delicious food. As with the correct preparation of herbs, whether an herb is delicate herb or hardy herb determines how best to cook with it. Hardy herbs tend to have strong “meaty” and hearty flavors, compared to the fruitier, more delicate flavor of fresh herbs. The durable structure of their leaves and the potent substances that make up their oils mean they are best added early on in cooking to give time for their flavor molecules to diffuse throughout the food. The flavors of delicate herbs evaporate swiftly, so they are best added in the last couple of minutes of cooking, or sprinkled on as a garnish. If they are added too soon, the nuances of their flavor will be destroyed by the heat of the pan before they get anywhere near the plate. 1) Cilantro Taste: Why Coriander (Cilantro) Tastes Like Metal or Soap to Some People?